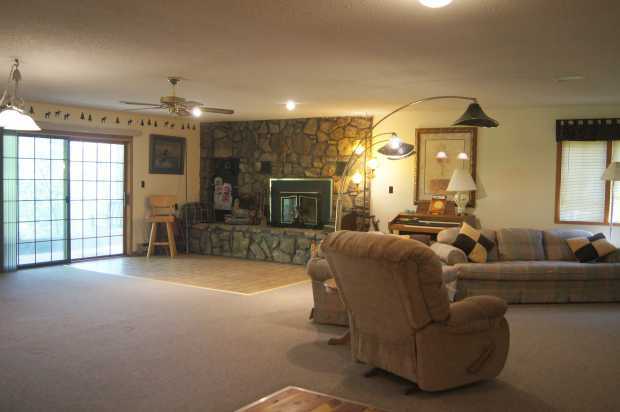 NOTE: Visit the “Photos;” link above to see every room in the house and cabin, plus the paths, lake, grounds, creek, area attractions, and more. There are also 16 photos in the description below. Start with “My Ozarks adventure” above. So, let’s talk about the property. It’s in a secluded, but easily accessed, section of Table Rock Lake — one of the premier recreation destinations in the Ozarks. 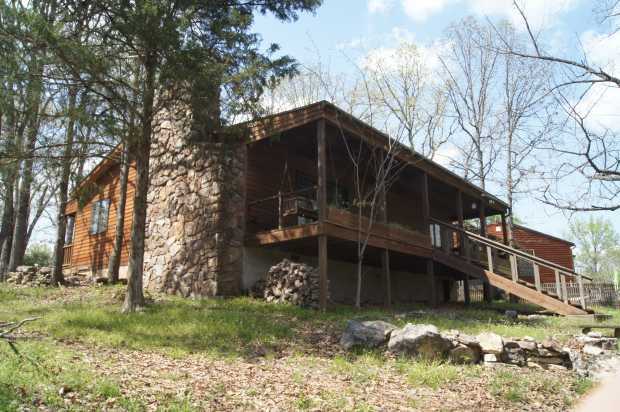 My quest for the perfect lakefront retreat finally ended with me buying this complex “sight unseen” in 2002 — after the recommendation of a friend and real estate agent who had been scouring the area on my behalf for months. 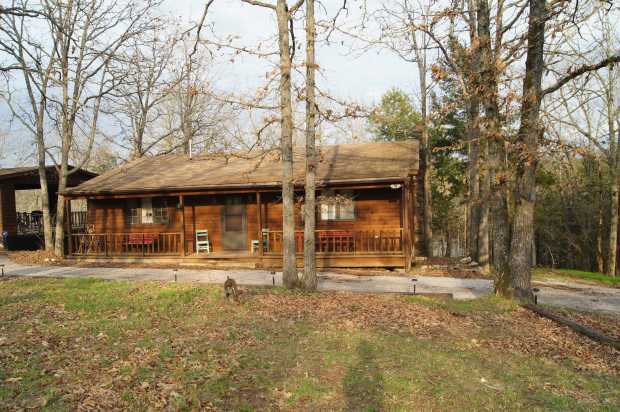 Obviously, I think it’s overwhelmingly good, otherwise I wouldn’t have extended my Ozarks adventure on the property for 11 years. After all, I grew up in Denver and lived in large cities like Los Angeles and Las Vegas all my adult life. So, this was a major change in lifestyle. When I first arrived to inspect the property that I already owned, I was amazed. It was much more than I’d assumed I’d purchased. The short real estate ad copy and verbal descriptions by phone from my agent had greatly understated how thoroughly the property matched what I’d been seeking. The owner was a woodworking craftsman who had done an amazing job of blending four types of wood into the stairway leading to the lower level and of creating built-in cabinetry throughout. The solitude and huge trees surrounding the buildings left me speechless. Even the attached three-car carport, opposite from the actual garage on the circular driveway ending, had open railings at the back, overlooking the lake. It was more of a huge covered patio than a carport — and came to be used as such. 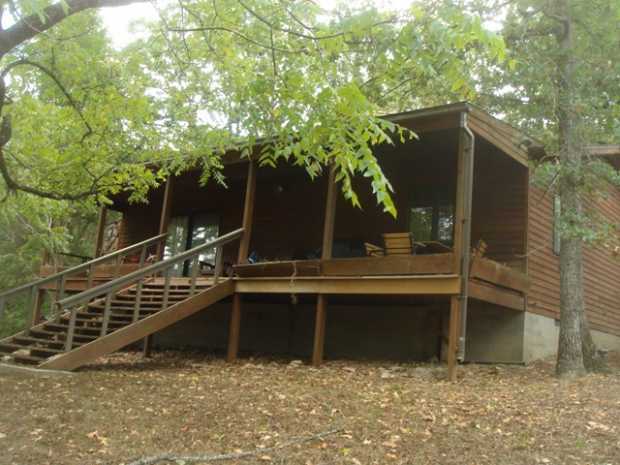 The fact that there was a cabin on the property had been mentioned as almost an afterthought. So, I’d imaged some run-down structure I should consider tearing down. But, no. It turned out to be a first-class 1,200 square foot rustic gem with an enormous fireplace, dwarfing the one in the main house. 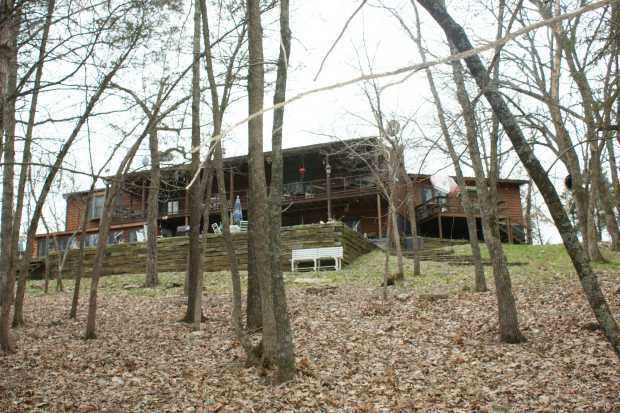 And it had a large balcony with an extra-wide staircase leading to a huge back yard and toward the lake. The house itself was as described — rustic and comfortable. It wasn’t flashy or lavish, like I might have been seeking back in California. But it definitely wasn’t boxy, having lots of interesting angles and nooks. Of course, I couldn’t help myself from making it even better. And I began that task almost immediately. I’ll tell you more about that in a few minutes. The approach down the 0.4 mile chip-and-seal driveway was inspiring. I turned left from the main road through a small clearing at the beginning of the property and continued into the forest. About halfway to the house, I came to a concrete bridge. 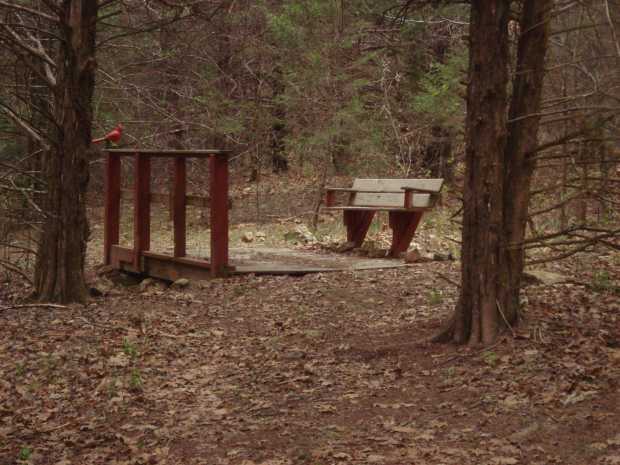 This crosses a creek that leads to the lake. It’s sometimes flowing, sometimes dry. Suddenly everything opened up like a park. The last quarter mile approach wound through grassy areas with large trees. A tenth of a mile or so later, I passed an enormous 2,400 square foot metal building that had been described as a barn, but wasn’t. It turned out to be an incredible surprise with high ceilings, two garage door entries, plus a regular door, many windows, a full concrete floor, and an abundance of electrical outlets. What am I going to do with that? I wondered. I could easily store a dozen cars, turn it into a studio to produce my videos, make it into a theater for presenting seminars and teaching, convert it into a separate residence, use it as a roller skating rink, or make it into a luxury stable for horses. Who was I kidding? I ended up just storing stuff there — mostly boats, my products for shipping, and items I acquired at local auctions, but never used. It’s about 2,400 square feet (60 x 40). It could be finished as an extra residence, used to store roughly 12 cars, serve as a deluxe stable for horses, used for storage, made into an elaborate playground, used as a large workshop, or dedicated to other things. I always meant to make something special happen in that building, but I never did. I usually referred to it as “the studio,” but that was silly, because I never got around to the conversion. 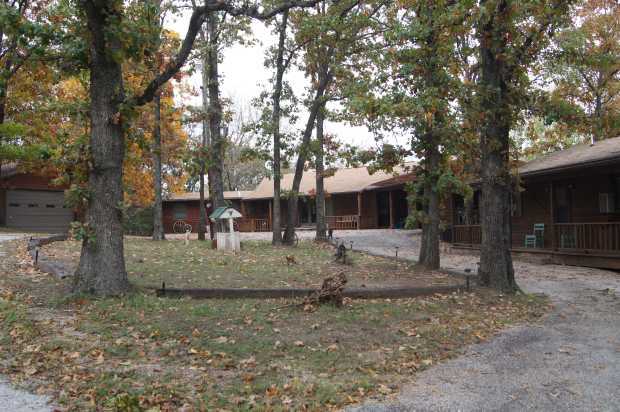 Depending on whether you veer right or left when you reach the end of the driveway and a central tree island surrounded by the structures, you either reach the house first or the cabin. It doesn’t much matter which way you go, because the house and cabin are very close together, as are the garage and a combination well house/shed — both on the left. The couple who had first owned and built the retreat wanted to reproduce the feel of a Wild West compound that they’d seen in a movie. All the structures matched architecturally — the house, cabin, garage, and well house. I immediately liked the effect. I drew these lines myself from a Google Earth screen capture. Obviously, they are approximate. I walked down a path to the lake, slipping and falling along the way on a flat rock. Lesson: Wet rocks can be slippery in the Ozarks. I visually confirmed what I’d surmised from looking at maps. The property was located at the end of an obscure arm of the lake and it was only 100 yards or so across below the house. To the left, the lake widened and you could see far in the distance. No boats in sight, though. Clearly, this was a secluded portion of Table Rock Lake. There was forest on both sides. Looking to the right I could see that a couple football fields distance, the lake narrowed further. Later I would take a boat up that haunting waterway through overhanging trees, making me feel like I was an explorer in a jungle. I also discovered that there was a small hidden cove on the property, easily accessed by a walking path about 200 yards from the house. It quickly became one of my favorite hideaways. When I toured the house, I felt instantly at home. It was built in the 1990s, with the cabin being completed first, serving as the couple’s home while the main house was constructed. Walking past the unusual double glass doors at the entry, I was in an enormous room. Psychologically it divided into several rooms or sections without walls. You could see part of the open kitchen and dining area in the distance. There was a stairway against an angled wall that led to the bottom floor. You can pretty much browse the photos to learn the rest. But I’ll mention a few things. There’s a fireplace, built-in rustic bookshelves, cabinets, and I added three skylights. The kitchen isn’t modern. If you’re coming from an upscale urban community, you’ll notice that the counter tops aren’t granite. They’re tasteful, but more in harmony with country life — some form of laminate, I think. I never replaced it. 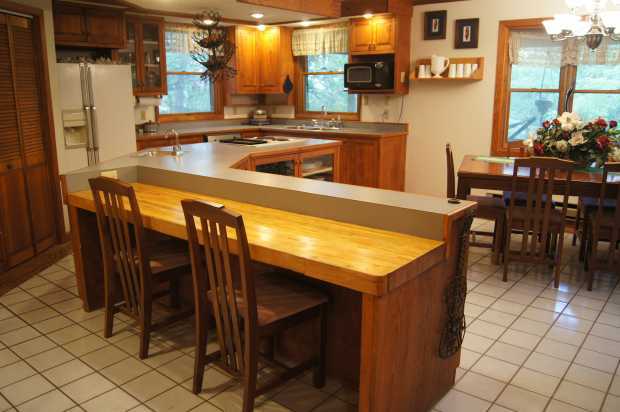 On the positive side, there is an abundance of counter space, both on the L-shaped portion beneath two windows and the kitchen sink and the large central island (also L-shaped) that includes a bar sink and a sit-down lunch or breakfast counter for four. The kitchen includes a double sink, stove/oven, dishwasher, refrigerator, garbage disposal, and microwave shelf. The bad news is that the appliances aren’t up to date. They’re strictly 1990s or so. But, to me, that’s just yesterday, and I never bothered to replace anything. After all, I wasn’t moving here to impress my California neighbors with the latest gadgetry. As long as I had my computers and the Internet, I could work on my latest projects. The full-size refrigerator had an ice-maker, the built-in stove/oven won my heart with it’s ability to convert one side from third and fourth burners to a grill, and the dishwasher has always worked fine. So, although I made massive improvements to fit my lifestyle, I left the kitchen pretty much alone. You might want to replace things to suit your tastes — especially if the “country comfort” look isn’t for you. What did impress me about the kitchen was the craftsmanship. The cabinetry was a personal project of the woodworker owner. All along the central island, facing the dining area, were wood-and-glass doors for storing whatever you wanted to show off. I filled it with ornate glasses, dishes, and ornaments from local auctions. There were also ample cabinets above both sides of the kitchen sink. The top level had only a single bathroom and bedroom when I bought it. I’ve since added a second top-floor suite, which I actually used as an oversize office, and another one and a half bathrooms — making the total bath count three-and-a-half (four-and-a-half) if you count the cabin a few seconds away. There are two bay windows, one in the dining area and one in the master bedroom. Both overlook the lake. There’s also a small office or additional bedroom conversion separating the main entrance from the kitchen/dining area, although the kitchen is open to the living area on the other side. It’s hard to explain, so see the photos. The handcrafted, four-wood staircase (with huge built-n cabinets underneath) leads to the lower level. Most of the downstairs is open, with a huge den area to the right and a cozy, semi-hidden space I used as a conversation area to the left. Straight ahead is a door to a covered porch and a massive patio that I at first used for basketball, but then adorned with umbrella tables, decorations, and a fire pit. It’s a nice alternative to the balconies, and you’re still overlooking the lake. Actually, there are three exits from the lower level. One is in a small room with a wall of windows, accessed by a glass french door. The other exit is in a bedroom or lounge area, also accessed by a glass french door, and leads to a private, fenced, lake-view yard, sandwiched between the side of the house and the lower wall of the three-car carport above. I often liked relaxing there, and it’s perfect for dogs, too. There’s also a large downstairs bathroom with extra storage and two small, unfinished utility rooms. On the far side of the lower level is another room that could serve as yet one more bedroom. It backs against a utility area, and you could add the missing closet for $150 or so. In fact, if you want it to be a bedroom, I’ll have that done for you. When I say it’s three to five bedrooms in the main house (plus one in the cabin), here’s what I mean: There are clearly three bedrooms (but, actually, I only used one and repurposed the others). But the small room (with window) downstairs could be a fourth, with the addition of a closet. And the small office upstairs has a space ready made for a closet. You would need to reattach the two doors, as I removed the double entry to form a quick pass-through from the entrance to the kitchen area. The entire plan has no hallways. It’s all open — upstairs and downstairs. You might or might not like that, depending on how you feel about hallways. I can’t quite make up my mind. I’ve already told you about my surprise in finding that the next-door cabin was so spacious. 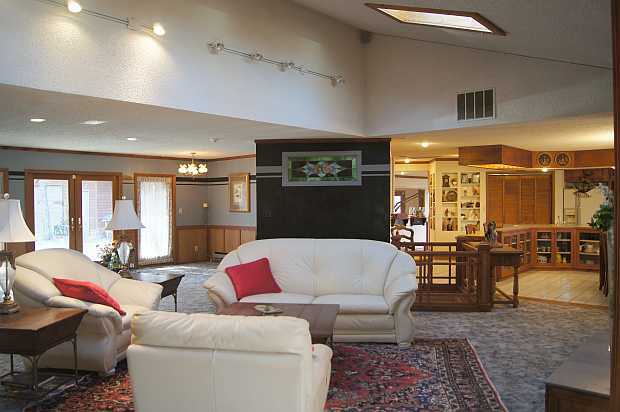 It has a huge balcony overlooking the lake and a massive fireplace. Although it’s 1,200 square feet, there is only one bedroom, one bath, and a kitchen. The rest is wide open. This is the place I chose to “vacation” when I chose to spend a night away from the main house. It’s also perfect for guests. One thing that’s clearly positive is the amount of storage space. You probably will have much more than you need. Let’s see — there’s a crawl space under the whole cabin, easily accessed through a door beneath the balcony, a hidden storage area in the main house, reached by a pull-up door in the office off the kitchen, the oversize two-car garage is extended in both length and width offering plenty of storage and a workshop area. Then there’s the 2,400 square foot metal “studio” I told you about, just a short walk from the house. There’s a small unfinished room downstairs, perfect for storage, as well as extra area in the downstairs utility room that has the furnace and hot water heater. There are also plenty of cabinets, a couple extra closets, large attics in both the house and cabin, space under balconies for tools and toys, cabinets beneath the main house staircase, accessible from both sides, a well house to store garden tools, and probably more places I don’t remember. I never wanted a second formal dining area, as the dining space with a chandelier, surrounded by display cabinets near the kitchen worked well for me. By “worked well,” I mean I never used it, except as decoration. I had become a hermit. Plus there’s a separate lunch counter. And you might find yourself doing a lot of outdoor dining on the balconies and beyond. But if you need an additional dining area, there are several possible locations for it. 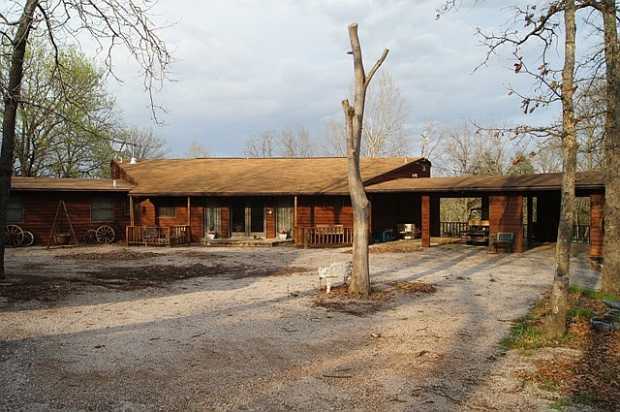 For me, the most compelling aspect of the property is the acreage — the land surrounding the house and cabin. When I first bought the retreat, the surrounding woods was unexplored and largely inaccessible. The only area that was easy to get to consisted of the cleared acres with trees on the last quarter-mile approach to the house. That was like a city park. But I was curious about what most of the land looked like. So, when the creek wasn’t flowing, I walked along it, away from the lake. After about half an hour of hacking my way through, I came to a riverbed with strangely flat rocks. I quickly coined a name for it, “the living room,” because it seemed to be a quiet room in the forest. I was immediately inspired and wanted to know more about what I owned. I personally engineered and cleared my first path, about 150 yards or so. And then I was obsessed and hired many others to add paths over the years. I wanted them to wind about and be wide enough for golf carts. Finally, I had over five miles of paths, having learned that there were over a dozen distinctly different areas hidden in my forest. Some were surrounded by cedar, some with ancient trees, some near the creek, some sloping up hills, some overlooking small valleys, some just plain mysterious, and some perfect for picnics. My paths formed a virtual maze and you could easily get lost for a brief time. And that’s how I wanted it. The bad part here is that I haven’t traveled most of the paths in two years, so you’d need to drive a golf cart over some of them several times to clear small plants that have grown. Usually, I do that just once a year, and it keeps me reminded of where every path leads.There are also fallen branches that you’ll want to snip each spring. I just keep pruners on the golf cart for whenever I encounter them. 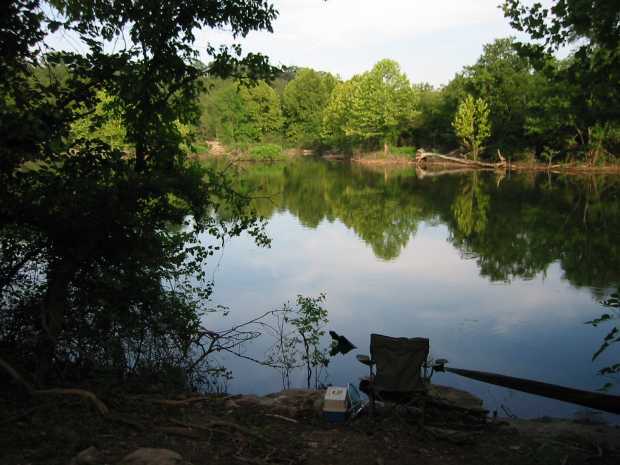 I occasionally fish, since Table Rock Lake is one of the finest bass lakes in the United States — as well as being heavily populated with catfish and bluegill, bringing out the boy in me. Yes, I sometimes use a float (a.k.a. a “bobber”) and fish for bluegill. You’ll encounter plenty of wildlife: wild turkeys, deer, squirrels, raccoon, rabbits, possums, birds everywhere, including eagles, and a lot more. I even saw a red fox once at a distance. There’s nothing dangerous here, though — except snakes. And in 11 years, I’ve had no close encounters with them. I’m not a hunter and, instead, treated the property as an informal wildlife sanctuary. 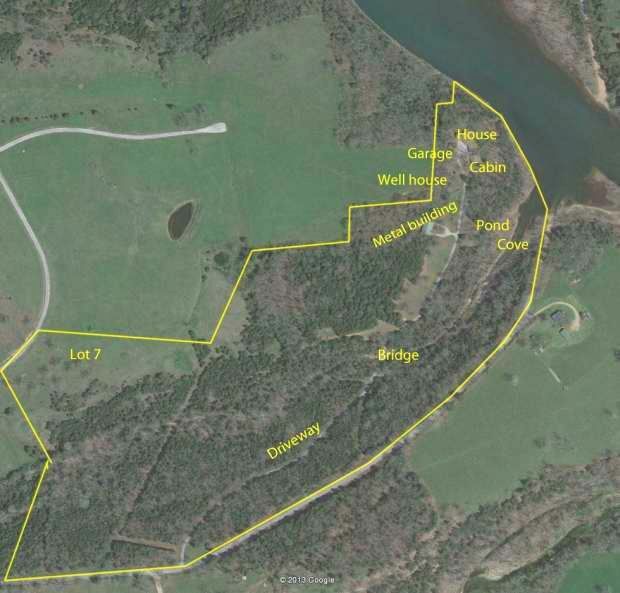 But, if you hunt, the acreage has many ridges, accessed by path, where you can sit and see deer below. Your choice. 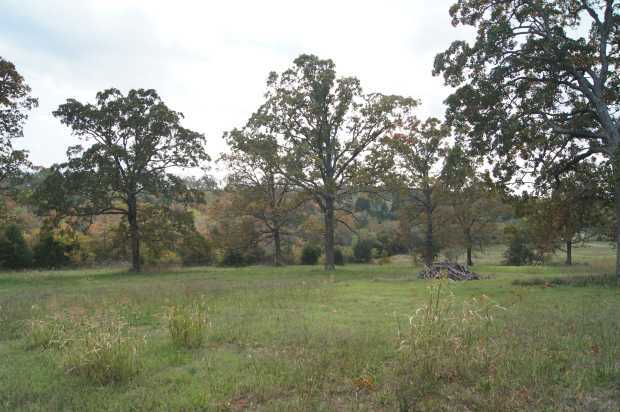 I’m listing the property as 31 acres, which is what it was when I bought it. But about halfway through my stay, a new subdivision was planned next to my retreat. By “subdivision,” I mean lots of 10 acres and greater, so don’t expect to have many close neighbors. The nearest house will almost certainly be out of sight. Anyway, one of the lots adjoined the main part of my forest. I wanted it, so I bought it. 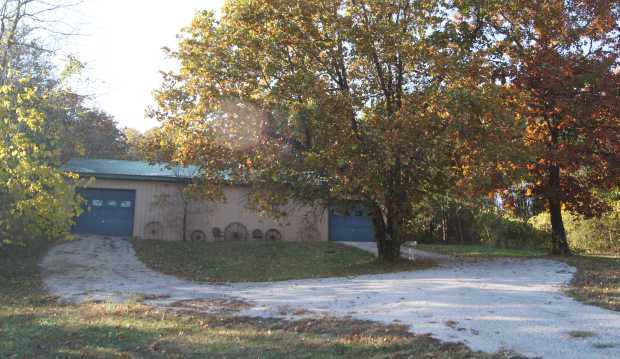 It’s optionally available with purchase of the main property for $39,500 or $55,000 if purchased separately. It allowed me to extend my paths, and it offered other advantages. On three occasions in my 11 years living there, the creek had risen above the driveway. I would only attempt a crossing with my old, heavy LandCruiser. 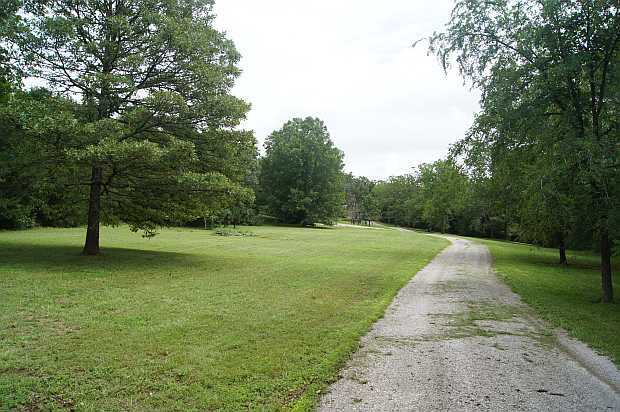 Now, using Lot 7, I had another exit, if that ever happened again — through my main property, across a field on the added 10 acres, past an oak grove and to the subdivision main road. The other key advantage to buying Lot 7 was that it gave me a future chance to acquire a slip in a proposed community dock. There is no dock zoning on my shoreline. I kept my boat six miles away in a slip I owned. It’s near Diane’s house, where I now live. What else? Please read the other sections to learn about the lake and the area, from my perspective. Mostly look at the photos and captions on the extra pages that follow. There’s a deep well to supply water to the house, and the entire Ozarks rests on a giant aquifer with abundant water. Electricity is cheaper than most areas in the United States. The house is all electric, with central air conditioning. Heating is either by baseboard, which I learned to like, because it allows me to choose how hot each area of the house becomes, or by a wood-burning whole-house furnace that the previous owners preferred. You might not like the fact that the view of the lake is through the trees. I decided to leave it that way, because I favored privacy over having a clearer vista. However, most of the high trees that partially obscure your view up the lake can be trimmed, as they’re on the property itself. 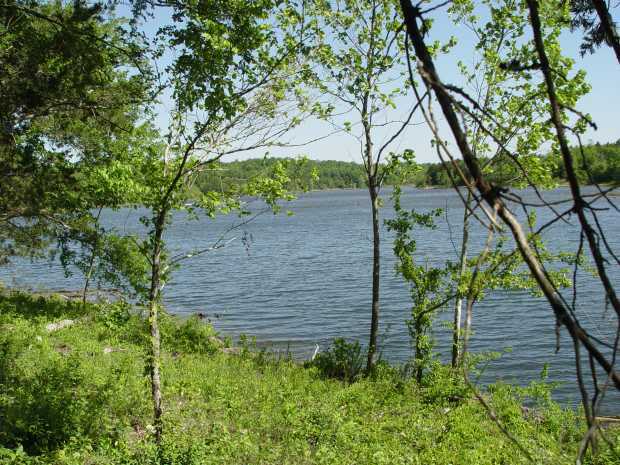 However, you can’t remove or trim large trees that are along the shoreline controlled by the Corps of Engineers. It’s protected. You can’t build there, but it’s yours to access and you can get a vegetation permit (as I have) that allows you to trim and remove small trees and maintain paths. Since nobody has ever accessed the Corps property from the lake in over a decade since I moved there, it’s like having even more than the 41 acres (31 plus 10 optional) that are defined by title. Anyway, that pretty much describes it. It’s true that you won’t find anything like this, but it might not be your personal vision of quiet solitude. It’s mine, though. As I said, the house is rustic and homey, not lavish or showy. The land can seem spectacular, but only if it’s what you want. If, instead, you’re looking for just a house on a lake with a small lot, you’ll find other great candidates in this area. I almost settled for that when I was looking for property here, but I’m glad I didn’t. You might use the property for a primary residence, for vacations, to rent, or as a bread and breakfast. Sure, it can be a retreat, a getaway. Well, maybe. That’s what I thought it would be when I bought it. But when it was time to return to Los Angeles, I didn’t.